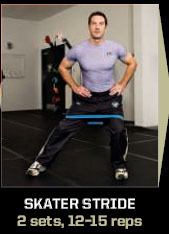 Build endurance and explosiveness with this quick, total-body workout from Mike Kadar, strength and conditioning coach for the Pittsburgh Penguins. Zip through all of them for a quick total-body workout, or just incorporate a few into your own routine. Sit on the foam roller so that your body is perpendicular to it and cross your left leg over your right knee. You should feel the pressure deep in your left glutes. Supporting yourself with your arms, roll back and forth on the foam, trying to work the roller deeper and deeper into the muscles (warning: this will hurt!). Continue for as long as you can stand it, and then switch legs and repeat. Roll both sides, one at a time, for a total of three to five minutes. Loop an elastic band above your knees and spread your legs so that you feel tension on the band. Step as far as you can to one side, and then bring the other leg in closer to the lead leg (but don’t lose tension on the band). That’s one rep. Perform two sets of 12 – 15 reps on both legs. Hold a dumbbell in one hand and set up as you would to perform a deadlift‹feet about hip-width apart and your lower back in its natural arch. Explosively straighten your hips and knees and pull the dumbbell straight up in front of your body until it is about chest level. Now quickly flip your wrist up to face the ceiling and extend your arm straight overhead. Reverse the motion to return the weight to the floor. That’s one rep. Perform three sets of 4 – 6 reps on both arms. Stand with your feet shoulder-width apart and your arms straight out in front of you, one hand on top of the other. 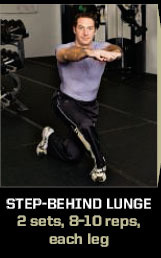 Lunge as far as you can to your left, planting your foot straight ahead, and lowering your body into the lunge as far as you can. Reverse the motion, stepping behind your right leg and planting your foot a few inches to the right of it (as if you were about to change directions). That’s one rep. Perform two sets of 8 – 10 reps on both legs. Hold a light dumbbell straight in front of you with each hand and stand on a box that raises you about a foot off the floor. Raise one leg off the box and straight in front of you. Squat as low as you can, and then return to the starting position. That’s one rep. Perform three sets of 10 reps on each leg. 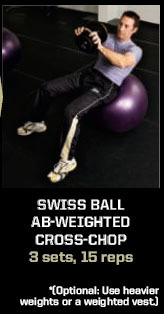 Hold a dumbbell with both hands and lie back on a Swiss ball so that your knees are bent 90 degrees. Press the weight over your face and bend your elbows 90 degrees. 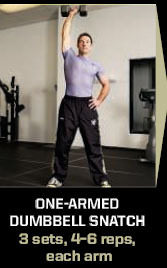 Crunch forward, raising your torso off the ball while simultaneously straightening your arms. Reverse the motion to return to the starting position. That’s one rep. 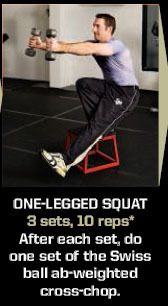 Perform three sets of 15 reps.
*After each set of the one-legged squat, perform a set of the Swiss-ball cross chop.